B4 Can You Hear Me? The famous British choral composer will sing with you his works including the piece “Can you hear me” which has a deep societal meaning. The atelier includes also pieces by his favourite composers. 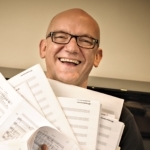 Bob Chilcott (UK) has enjoyed a lifelong association with choral music, in the choir of King’s College, Cambridge, and in the King’s Singers. He became a full-time composer in 1997 and his choral music is published by Oxford University Press. His works include St John Passion, Salisbury Vespers, Requiem, and A Little Jazz Mass. Bob has conducted choirs in 30 countries and worked with thousands of singers in a continuing series of Singing Days. For seven years he was conductor of the Chorus of The Royal College of Music in London and since 2002 he has been Principal Guest Conductor of the BBC Singers.